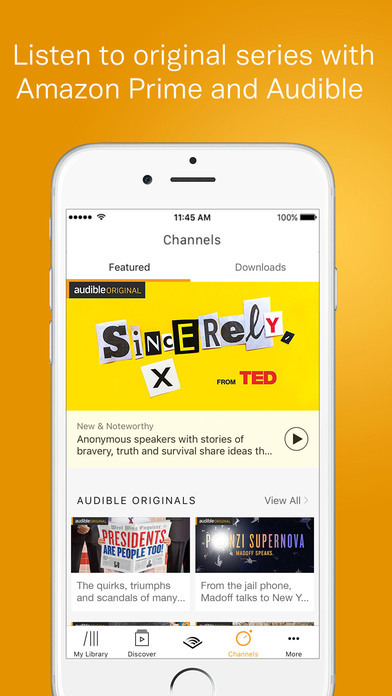 Audible is home to a library of over 180,000 audiobooks, podcasts, and Audible Channels. This tool comes with a complete customization of your listening experience. "One of the best carplay apps that I really enjoy. Perfect companion when I'm driving without being too worried and I'm able to tolerate the more than usual hours of driving. After the free trial, I have it now"
"Audible is a godsend. A great thing to use for any of your book related needs. Romance, comedy, anything. How powerful audible is, is ridiculous. A great genuinely genius platform for anyone interested in just listening to people, or wanting to read but not liking to read." "I already got tired of reading especially after work so I subscribed to Audible from Amazon and got so lucky that there are high quality audiobooks here! 5 stars!" "I have used audible for a while past the trial period because I forgot to cancel it. I really liked it but I am not sure if I can afford it. The selection is good but if you have a certain book in mind you may be out of luck. This is a good app if you are in the mood for nothing specific. The interface is nice, though. It is easy to navigate and save your place for later. " "I hadn't tried Audible, but I started the free trial and I've been using it every day on my commute since I have to get on a train for about an hour. I think I'll subscribe when the free trial is over, cause at least with an audiobook i can keep myself entertained on my long commute"
"Audible is by far the best app for audiobooks. It is owned by Amazon so you know their library is massive and they have top notch quality. The great thing about Audible for frequent readers is their monthly subscription option. " "There are better, cheaper options out there. Check your local library's website." "Audible has plenty of vampire books...because they have so many of all types of books available. Audible is great for listening to audio books!" "My friend from Guatemala suggested that I watched Doctor Who but I didn't have the time yet because of busy sched. I thought of just listening to audiobooks first just to check if it's a good one. So I got one on Audible, the very first one. I like it that there are sound effects!" "Audible is the place to go when you want to get audiobooks for a long drive, or just to sleep to. I do prefer reading, but I can't read while driving my car so audiobooks are the perfect way to mentally prepare myself for the long workday ahead, or to unwind and chill out after a tiring day at the office. I have some favorite authors, and have also come across some books that I could not wait to get back to reading, so I buy copies from Audible and get story time even if I'm not at home." 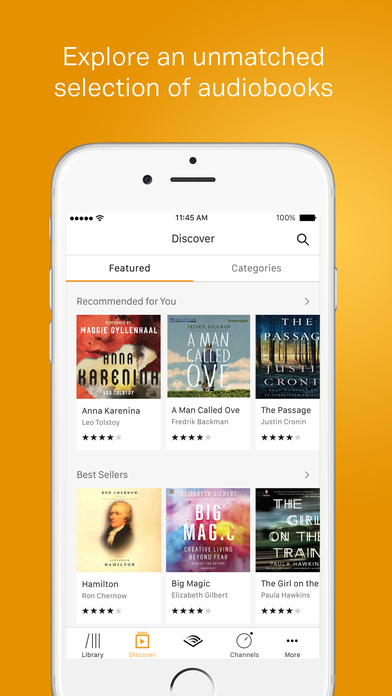 "If you're wanting to get the books read out loud, Audible is far and away the best app for it. However, if you're wanting an app that more directly teaches about lit ideas, this is not the one for you. It's good for just buying the book itself, not for getting an analysis." "Audible is great for the car when you want to listen to an audiobook on the morning commute and they have a great selection." "great app with free trail"
"I love that Audible is by far has the largest audiobook collection among other apps. Ever since I got to try audiobooks using this app, I did lay low reading hard copies. " "I love audible as an alternative to reading books. Listening to unabridged audio books is much more enjoyable than forcing yourself to read in the evenings. You can lay in bed at night and listen to books without the hassles of lights, glasses, etc. Highly recommend this as an alternative to physical books. Plus you get free books every month with a membership!" "Audible is a great resource for audiobooks, but as far as free ones you won't find much here. The site is based on a subscription model which gives you credit per month to download whatever book you like. It's the grand daddy of all audio book sites." "Audible offers a huge selection of audio books and a free trial offer. I love that I can enjoy my favorite books while driving to and from work. The narrators are truly talented actors and they have titles to suit every taste." "I bought the eight audio books included in the Outlander series through Audible. i gotta be honest i didn't buy them all at the same time because imo it was quite expensive. Oh well audiobooks are really expensive eh. But my purchases were def worth it! I can even listen to the audibook during my car ride eh"
"Audible is one of the most successful audio and ebook companies. It is a safe best to get any kind of books from them and their app." "Audible is great because it has one of the largest audio eBook libraries available anywhere online. It's a division of Amazon, who got their start online selling books, so you know they have decent books and not just sheer numbers of books for the sake of inflating their numbers up. And when you select a book, it's quick to download into your device." "This is a great app, I love the podcasts and I learn so much everyday while iam at work. Easy to use and very informative"
"Audible is a must-have app for anyone with an interest in ebooks and audiobook content. It's that simple - if you listen to audiobooks as much as I do, you'll have a hard time ignoring Audible's great library. Better yet, it comes with a free trial - you have zero excuse not to get started!" "Why not listen to an audio book when you play video games? Audible is one of the best apps for geeks because it increases your knowledge." "Signed my wife up for their trial and she couldn't be happier. She's into a lot of different genres but lately it's been all about medieval romance, and she said there are plenty of novels to choose from. Not to mention she said the audio recording aren't terrible quality. " "I love this app! I can browse for my favorite Authors or by my interest that month. It's easy to purchase, quick to download, and just as easy to start listening. Highly recommended!" 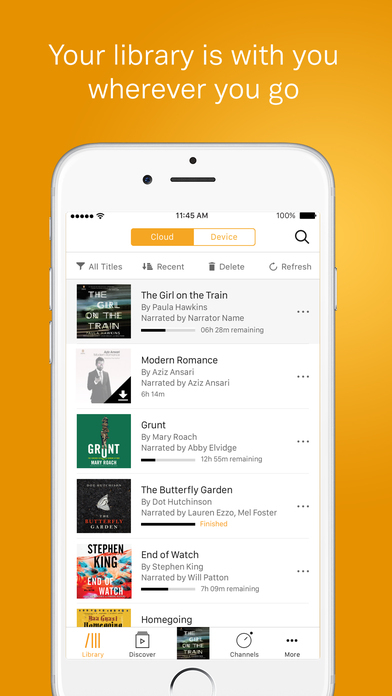 "Audible is one of the most popular apps out there for audiobooks and is a great transition for a bookworm who is looking to transition into audio, but may not be a suitable app for someone who still prefers to read." "I love this app because it has a very wide selection of books for me to choose from. The app itself is also very easy to use, and I can change what book I want to listen to without hassle." "Amazing app for listening to books on the go! The Apple app is better in my opinion due to slightly better controls and trophies for completing milestones in audio listening. I mostly use it for start and stop listening and I have never had a problem with it stopping in the exact spot I left it in. Best to browse for new audiobooks online using your computer." "My kids are always being shuttled with me over long distances. Getting them to behave is a difficult task. My kids like to listen to stories so I downloaded Audible audio books & podcasts. I search through and get my kids things I think they will like. So far it has been pretty good at keeping their attention. I like it." "Having trouble keeping that kid distracted? I recommend Audible, it has so many titles it will keep you and your child entertained for hours. It also has podcasts that have all the big names. Its usability is very friendly and easy to pick up. " "Audible is the number one app for audiobooks. I've used it for a long time and experienced many books I otherwise wouldn't have without an audiobook version. 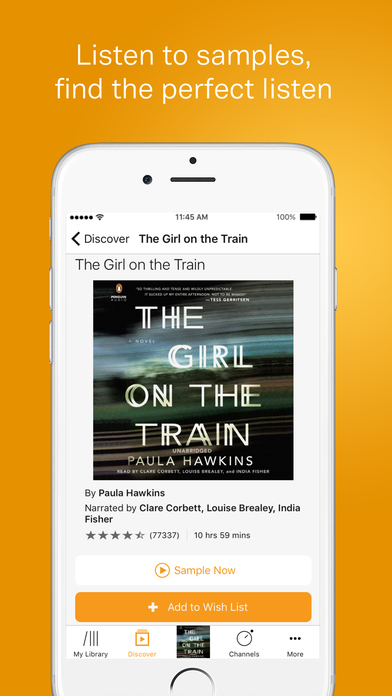 Audible is one of the best apps on the market for EBooks, and with good reason. It's an amazing service." "Audible is great for podcasts and books. They have a huge selection." "This is a great product that allowed me to refresh on my Spanish conversational skills. I haven't taken Spanish since my first or second year of high school. However, using this audible program really helped me pick up where I left off. It seems as if I hadn't missed more than a couple years. I was able to recall much of the information that I learned before. Furthermore, this program really helped me with the correct verb usage and pronouncing many of the words that I was unaware of. I am preparing for my trip to go to Spain in a couple months. Thanks to this program I now feel much more confident and excited about my trip. I feel as if I will be able to have fairly fluent conversations with many of the locals and be able to ask questions and get recommendations about where I should go and visit while I am in Spain." "Audible itself is a website that offers audible books and does not solve the problem in itself. I could possibly find books on practicing Spanish conversation on this site and listen to the audiobooks, but the platform itself is not specifically for this purpose. Its primary purpose is a source of audio books." "I would have to search for some useful books based on reviews. I find it much less useful and time-consuming." "Audible was aimed more at the Audible books crowd and not necessarily any guides for speaking Spanish. It did not work for me at all"